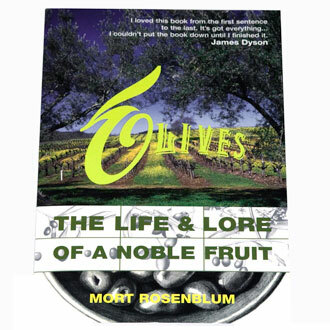 If you consider yourself an olive oil aficionado and haven’t already devoured Olives: The Life and Lore of a Noble Fruit, then I suggest you have some reading to do. While many books about olive oil have been written in the past fifteen years since the publication of this classic in 1996, few have mastered so thorough an examination of the subject. Delightfully-written, yet exhaustively researched, Olives is part history book, travelogue, culinary journal and farming manual. Rosenblum travels from his own overgrown olive orchard in the south of France to Spain, Greece, Italy, Morocco, Israel and the U.S. in search of the elusive meaning behind the age-old affection for the olive and olive oil. He finds it in backyard olive groves in Beit Jallah, village festivals in France, and giant production warehouses in Italy run with sometimes dubious intentions. Winner of the James Beard Award, this homage to the olive has been applauded by the likes of Patricia Wells and Christiane Amanpour. Peppered with poetry and simple recipes, it belongs on your bookshelf, right after you finish the last page.